TGIF! What do you have planned this weekend?? December is such a busy month, but I love it. We have Christmas/birthday parties to attend every day this weekend! Unfortunately, I'm sick with a nasty cold again, so I'm praying I feel well enough to still enjoy everything! Anyway...on to fashion! 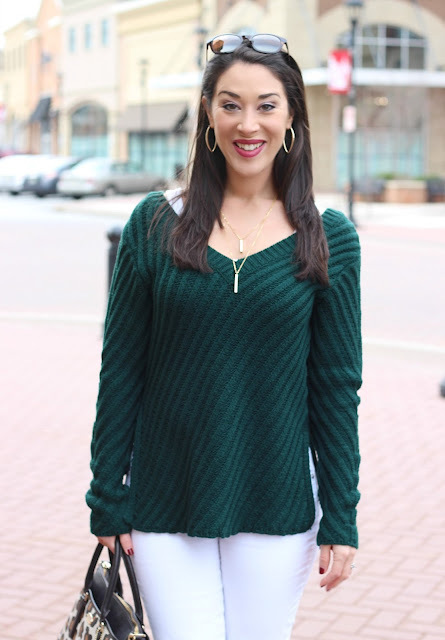 I picked up this v-neck pullover sweater at the Nordstrom holiday shopping party last Sunday. It is SO SOFT and the green color is beautiful for the holidays! It's pricier than what I would normally spend on a sweater ($49) but when I tried it on, I fell in love with the quality and style. 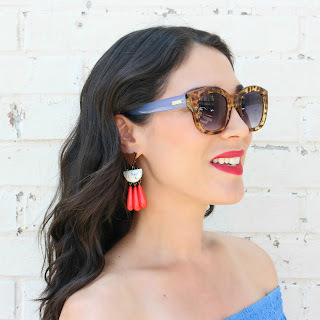 I love how it falls slightly off the shoulder and the side slits add a fun flare! I'm sure this sweater will go on sale soon, so I'll keep an eye out! FYI- I wore a layering white tank underneath since it's pretty low cut. 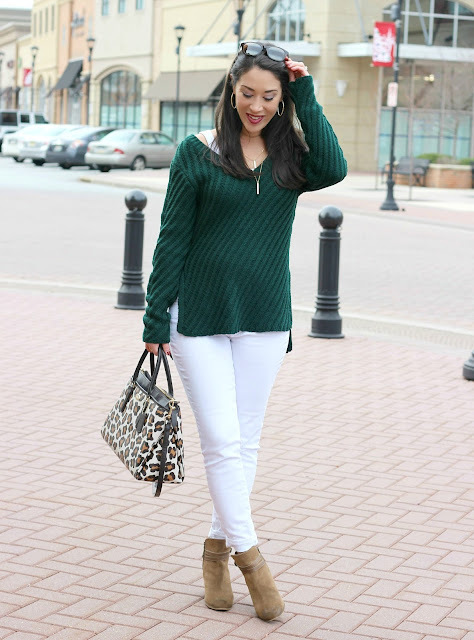 I had originally planned to wear regular jeans but when I laid my white skinny jeans (40% off with code STYLEEVENT) next to this sweater, I just loved the combo!! There is something about hunter green and white that is so crisp and wintery! 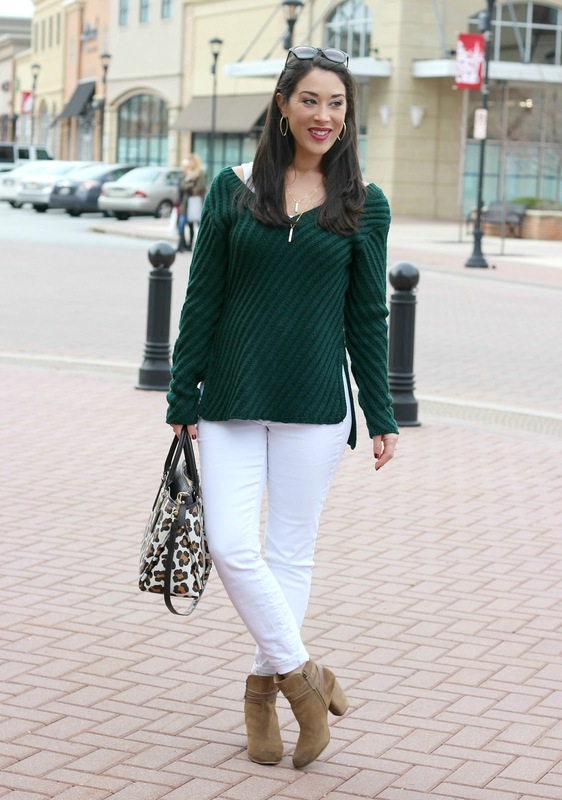 The white denim definitely brings out the festive hunter green color. 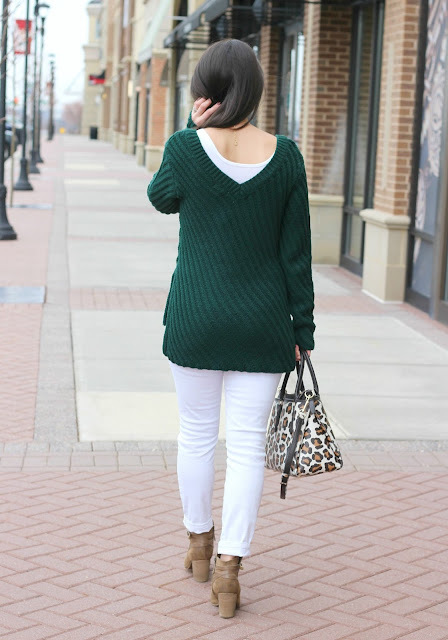 White jeans are no longer taboo after Labor Day, so break them out and try them with your favorite sweater! Here's a look at the back of the sweater. The v-back makes it unique compared to a basic sweater and I also love how the length is slightly longer in the back. I carried my leopard Coach bag to add a pop of pattern to the outfit. 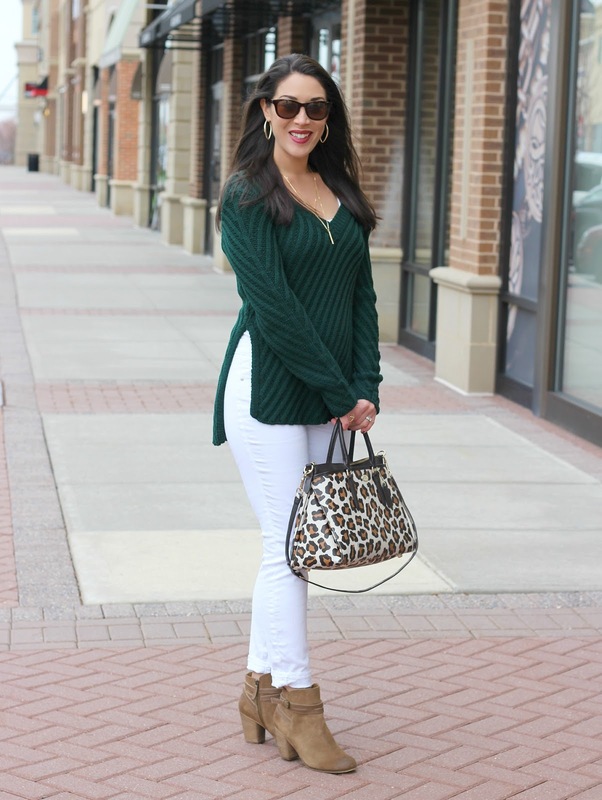 Leopard is a great neutral and adds some interest to any look! The pattern of this bag is really unique and I love the white background. This purse is from last year but here is a similar version on Poshmark. I went with simple gold jewelry for accessories. This layered Baublebar necklace was a Black Friday purchase. It must have been popular because it's sold out already! I really like this Cadence Layered Necklace Set, too, and it comes with a single choker necklace (wear alone or with the set!). By the way, this necklace set makes the perfect Christmas gift! For God so loved the world that he gave his only son, that whoever believes in him will not perish but have eternal life. Cute sweater!! Love how it cuts up on the sides! Does the white shirt come with it underneath? I see its on the Nordstrom pic too. Thanks sista! No, the white tank doesn't come with. I just wore one I have from Target! 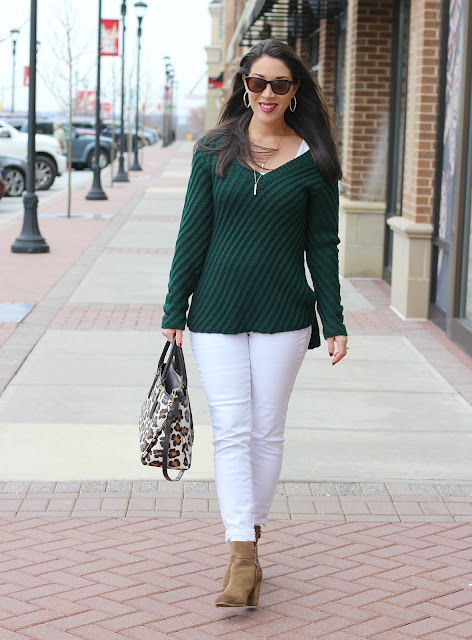 Gorgeous sweater - love the color! 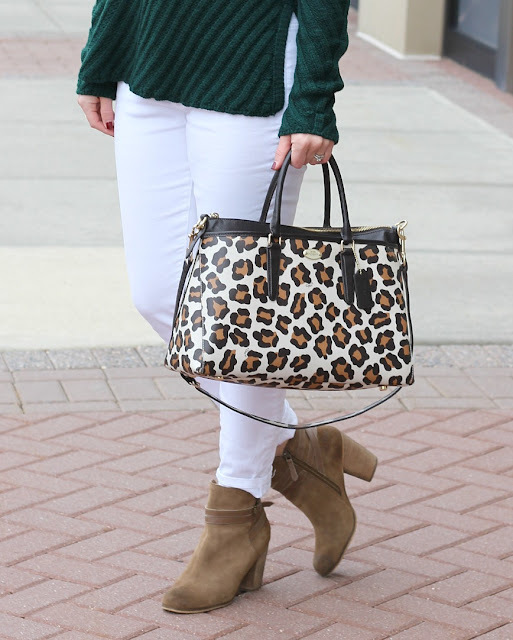 Looks great with white jeans and I love that bag!